The good news is that your Maker is your personal loving Father who made you part of his only Son so that he could express himself through you in his universe. The bad news is that you don’t accept that and your nature has become dependent on that universe instead of his love. You can see the result from the red arrows in this diagram that your needs for security, significance and happiness begin to depend on things and people and circumstances outside rather than on the Maker’s son inside - so your very nature becomes corrupted as you try to get from things and people and circumstances what only your Father’s love can give. 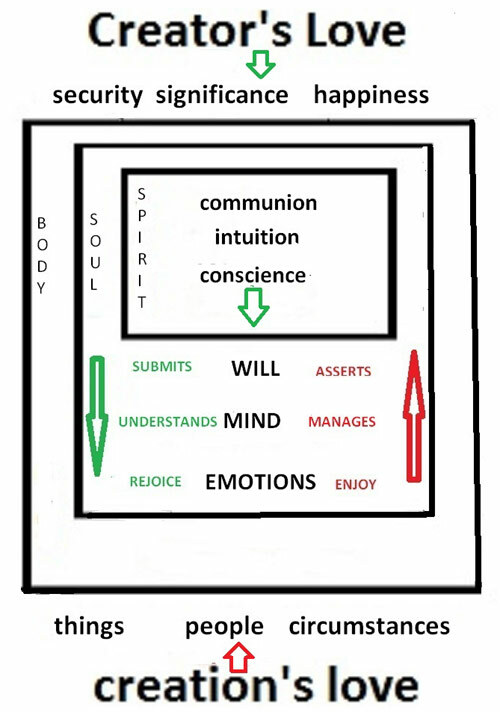 So as you can see by the green arrows in the diagram, instead of letting our Maker's Son inside us develop the world through us, we develop our personalities to get from the world outside what we are made to get from our Maker's spirit inside us. Our inner consciousness of God - our spirit - dies, and our psychological part - our soul - is corrupted and perverted so that the mind is bent on manipulating things and people and circumstances for our benefit instead of understanding our maker's plans for them and us, the will on asserting our rights rather than submitting to our maker's will for us, and the emotions on enjoying self-gratification rather than rejoicing in the abilities we exercise. Let's look now during these next ten talks at the ways this corrupted human nature becomes a carnal nature that we cannot control but can only be remade by its Maker. We find in our everyday practical lives that our minds, emotions and wills seem to be controlled at times by a carnal nature that frustrates all the efforts we make at self-improvement. We've read so many self-help books and tried so many "wonder" techniques, but still we cannot - as the Bible says - "do the good we want", but instead "do the evil we do not want". However, we do not recognize that this Jesus is actually in us so we have no belief like him that our Father knows us or cares about our food. Therefore we have no assurance that he would give us what we need; besides everyone around us assumes that money is essential to buy food, so obviously we have to earn money to stay alive – this is the main purpose of work. This, of course, sets up one of the most basic short-circuits in our personalities – security comes from money and money comes from work. As the Bible says “by the sweat of your brow you eat bread”, so worry about losing your job and anxiety in a recession create a perverted chain reaction between our work and our basic sense of security. Moreover that has become so ingrained in human nature that we refer to it as “inbred sin” – meaning the attitude of a fool that there is “no God” has become natural for us humans. All of us know the stomach upset that occurs when we lose our jobs or hear that our company is in trouble. Even though you know it’s wrong to worry, you somehow can’t control the restlessness that makes you toss and turn in bed at night. The problem is not acid in the stomach or lack of tranquillizers or even a steadier job or more stable company – the problem is that you are absolutely convinced that only money can guarantee your security and enough food to keep you alive – because you have no sense that your Maker’s son is in you to do something that he can do only through you – and, therefore, your loving Father is going to ensure you have what food you need. But the connection between your stomach and your mind’s grasp of the economic situation is such a basic habit of all the cells in your body that you cannot change it – however hard you try. This old corrupt nature is so dependent on its environment that it cannot respond to Christ's spirit within you, so - as we discussed in number 47 of these talks, God foresaw this before he made us - and remade you in eternity outside time. So deliverance from insecurity about your job and livelihood requires your old nature to be replaced by the nature of Christ. God will actualize that only if you are willing. Are you willing to die to your own judgement of how much food you really need ? Are you willing to let your Maker's son live the life he planned through you ? Will you trust Him to get what you need - and concentrate on letting him do the particular work that he can do only through you and your unique life ?